Animal Super Squad is an unusual two-dimensional action game, in which the players assume the role of a selected animal. The objective is to complete levels and solve simple physics-based riddles. The game features an advanced level editor. Animal Super Squad is a funny action game in which the players assume the role of one of three animals: a chicken, a fish, or a sloth. One of the most important features of the game is an advanced editor (not available in mobile versions) that enables the players to create their own locations and to share them with other players. The game was developed by an independent studio DoubleMoose Games. Animal Super Squad is a two-dimensional action-adventure game with puzzle elements. The action is presented from a side perspective. The players can assume the role of one of three animals (a chicken, a fish, and a sloth) and drive one of the available vehicles (the differences between them are purely aesthetic). The objective is to get through levels and solve simple physics-based riddles. By progressing in the game, the players can unlock items that change the appearance of the characters, for example… a dead octopus used as a hat. The versions of the game available on home gaming systems feature an advanced editor with all the tools that were used by the developers. It enables the players to create their own levels and then share them with other players. The developers even included an option to vote on the maps the players like the most. The most popular maps are then presented in a special weekly list. 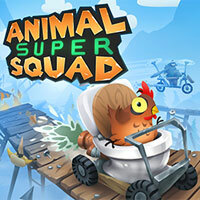 Animal Super Squad features only a singleplayer mode. Although the action in Animal Super Squad takes place in two dimensions, the game features three-dimensional graphics that look nice. The decent results were obtained thanks to the graphics style that resembles animated movies and cartoons for kids.